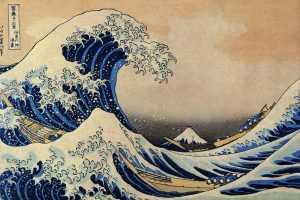 We will look at Hokusai’s print of the Mt. Fiji behind a great wave. We will talk about foreground, middle ground and background as well as, atmospheric perspective. Kids will then create their own Mt. Fiji and wave painting that will capture depth between the grounds. The cost of the 2 hour class is $3 CAM member/$6 non members. All other materials will be provided.